Today, which celebrates 60 years on air towards the end of this month, is the cornerstone of the Radio 4 schedule. It's one of the programmes, along with The Archers, Desert Island Discs and the Shipping Forecast that define the station. Thinking of itself as 'setting the agenda' for the day's news output it retains a healthily 7.6m weekly listeners in the face of numerous online news outlets and probably remains the most listened to show by the movers and shakers in Westminster and the City. John Humphrys locking horns with the Chancellor of the Exchequer is a far cry from the programme's origins which didn't sully themselves with politics but instead offered stories of the 'gosh aren't people interesting' variety mixed in with reviews of the latest gramophone records and a bit of sports news (so at least the 1950s equivalent of Gary Richardson had a job). However, its original premise of broadcasting items "which can be said to have a topical interest for the average, intelligent reader of morning newspapers" would hold true today. 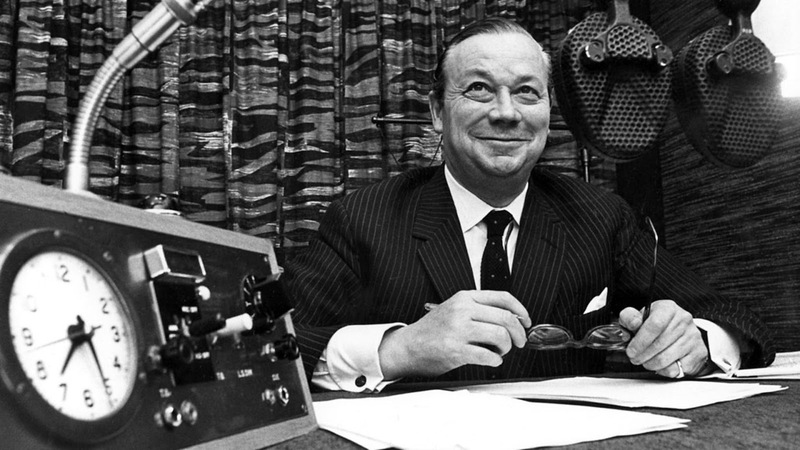 The creation of the Today programme stems from the deliberations of a BBC mid-1950s working party chaired by one Richard D'Arcy Marriott, the Chief Assistant to the BBC's Director of Sound Broadcasting. It proposed an alternative to the light orchestral music heard on the Light Programme with a Morning Miscellany, it's first working title, on the Home Service. It was to be the responsibility of the Talks department under the Chief Assistant Janet Quigley and producer Isa Benzie. Naturally enough coming up with the programme's title caused a flurry of internal memos with, unbelievably, Up in the morning early, Background to shaving and Listen while you dress all floated before Isa Benzie came up with Today. Eventually the programme's brief was thrashed out and was summarised in a memo from H. Rooney Pelletier, Controller Programme Planning (Sound). The start date was fixed as 28 October 1957 with two daily editions as 7.15 am and 8.15 am (a pattern that persisted until 1970). Items would be short, no longer than 5 minutes, with material drawn from Talks, News, OB and the Regions. Likely topics would be: "Notices of new theatrical, opera or cinema productions. Various OBs under the general heading Going to Work Today. Reviews of gramophone record releases (both serious and light). Items about dress, fashion, cooking, shopping -and, if exceptional - weather. Brief personal stories of the Truth to tell kind. Previews of sporting events: cricket, racing, football. medical notes - usually suggested by items in the news. Notes on industrial developments - particularly in the field of consumer goods. Foreign correspondents and material from news Talks Section of News Division. Possibly a daily quotation. Notes about significant anniversaries". This idea doesn't sound a million miles away from a similar programme idea that was proposed to BBC bosses by one of its Talks producers in 1955. Memos uncovered by Paul Donovan when we wrote his history of Today show that a certain Robin Day had written about a Morning Review that would give "intelligent, pithy comment and description of the sort found on the feature-page of newspapers and in the more serious dairy column". Day expounded on the idea in two lengthy and detailed memos but Home Service producers couldn't see the demand for such a programme and it was quietly forgotten. Day, meanwhile, went off the join the fledging ITN news service. When Today did finally make it on air it was presented by staff announcer Alan Skempton (pictured above). No recording or script of the first edition survives but the Radio Times billing read: "A breakfast-time magazine, bringing you news, views, and interviews. Including: Briefing a pilot at London Airport, First Night at Liverpool: Robert Morley. Sale of Napoleon's letters. Out Today: gramophone records." It was something of a curate's egg according to an internal review. The interview of the pilot and a passenger by Raymond Baxter failed to raise little of interest, the talk by Mary Drummond was interesting but her voice was "soporific and/or irritating", Robert Morley was the best thing in it, the music was "all right" but the inclusion of pop "seemed awkward" whilst Eamonn Andrews report on boxing was good. The programme did, however, immediately make an impact, if only because nothing like it had been heard before. Pelletier was keen to stress "hard information - facts - are probably the most important single ingredients" and that the presentation should be seen as "clear, friendly, straightforward". That presentation style changed radically the following year when Jack de Manio, another staff announcer, joined the programme. Skempton had been dropped earlier in 1958 following an unfortunate unscripted comment - though BBC records fail to elaborate what this was - and Robin Boyle had continued as the main announcer. It was Jack de Manio, he of the "port-wine voice", that steered Today throughout the next decade or so, his somewhat eccentric style endearing him to listeners but driving producers to distraction. If the few remaining snippets in the Sound Archives are anything to go by his main difficulty was telling the time, an issue for a breakfast programme were a reminder that you need to be off the work or school is a vital component. Apparently he was "a spendthrift" - there are numerous memos to-ing and fro-ing about his fees when he became freelance - wore Savile Row suits, drove a vintage Bentley and "was completely unmanageable for his production team". On one occasion he got stuck in a Broadcasting House loo and reporter Tim Matthews had to cover for him. He was known to spread out his script over the desk and read out introductions at random with the poor producer having to anticipate what was coming next and adjust the timings accordingly. During the early 1960s there were the beginnings of a shift to change the nature of the programme to give it a newsy feel. In 1963 production transferred from Talks to Current Affairs under the guidance of Stephen Bonarjee. He thought Today had too many jolly magazine items and with audience figures falling wanted to add "sharper, harder material". Behind the scenes he introduced a daily 5.15pm editorial conference to discuss the next day's potential items and in 1968 changed the staff working patterns to create an overnight team to work on the programme and brought in equipment for allowing taped reports to be sent down telephone lines rather than physically brought into Broadcasting House. Despite this the programme in the mid-60s still had a slightly quirky reputation as airing, according to John Timpson, "eccentric octogenarians, prize pumpkins and folk who ate lightbulbs and spiders". Nigel Rees, first a reporter on Today and later a presenter, recalls some of the freelance reporters of the late 60s as Tim Matthews, Derek Cooper (later of The Food Programme), Malcolm Billings (for many years the presenter of The Merchant Navy Programme on the World Service), Derek Parker, Barry Brown, David Bellan (later on Radio 2's Star Sound) and Jeanine McMullen (later on You and Yours). A programme regular was Monty Modlyn "a rubbery-faced, little ball of a man and a Cockney 'professional personality'". Monty's contributions tended to be the antithesis of the hard current affairs stuff such as going up in a balloon, visiting a nudist colony, finding lost dogs and bringing lonely hearts together. Modlyn continued to appear on Radio 4 in the early 70s in his own programmes as well as being a regular guest on Start the Week before joining LBC as one of their presenters. One of a number of exercise LPs released by Eileen Fowler. of BBC TV's About the Home. 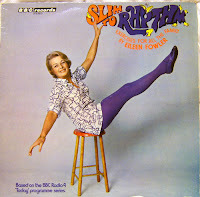 Listeners to Today in the early 1970s could limber up each morning before heading out for the day when the Keep Fit feature with Eileen Fowler was introduced. Eileen had been encouraging the nation to swing into shape since the 1950s on BBC TV and her 5-minutes or so of exercises were heard weekly on Today until 1976. By 1970 the Radio 4 controller Gerard Mansell was seemingly despairing of Jack de Manio's off the cuff remarks. "I think Jack de Manio's reference to 'Yoko Hama or whatever her name is' in this morning's second edition, and his comment to the effect that he didn't care whether or not she and John Lennon went to bed together went further than we ought to allow Jack to go." Jack was dropped from the weekday editions of Today the following year, sadly missing his final edition due to being in hospital with gout. As a consolation he was offered an afternoon chat show Jack de Manio Precisely. The 1970s witnessed a positive revolving door of presenters. When de Manio left John Timpson became the main presenter. 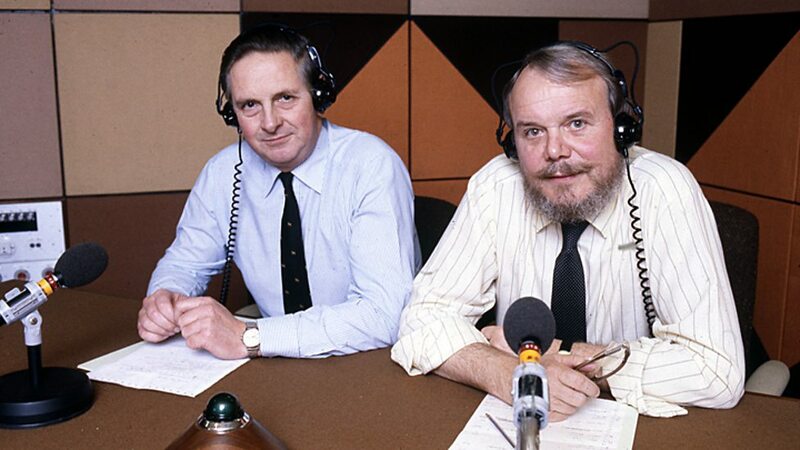 John had originally deputised on the programme back in 1964 but then went off to BBC2 to co- host Newsroom with Peter Woods before returning to radio in 1970 to sit alongside Jack on Today. By 1970 the two editions had been united into one whole -apart that is from all the opt-outs for listeners in Scotland, Wales, Northern Ireland, East Anglia and the South-West, the junctions for which the presenters had to hit with pinpoint precision - and the tradition of two presenters, that still exists today, was established. The editor, Marshall Stewart was finally able to introduce the harder current affairs edge that had first been mooted years before; such was his success that he was poached by LBC. Joining Timpson in 1971 was Robert Robinson and they became the mainstay of Today for the next three years. Robinson, according to Marshall Stewart "played a significant and influential part in accelerating Today's transformation from a whimsical magazine into a news and current affairs programme. His sharp intellect introduced an edge to serious interviewing that politicians, in particular, had not often met on radio before." Also joining the roster of presenters were Douglas Cameron (1971-74), Michael Clayton (1973-74), Desmond Lynam (1974-75), Barry Norman (1974-75), Malcolm Billings (1974-75) and Nigel Rees (1976-78) - for a full list see the end of this blog post. From 8 October 1975 here is John Timpson reporting from the Conservative Party Conference in Blackpool and interviewing Geoffrey Howe, Des Lynam is in the studio in London. Des recalls that during his time on Today "although politics was very much part of the programme, overall it had a lighter feel to it. There was still time for the 'record egg-laying hen' type of story. "; witness the New York food smeller (organoleptic analyser) in this recording. The sports reporter is Gerald Williams and the newsreader Colin Doran. Audio courtesy of Richard Tucker. It wasn't until late 1975 that the dream team of Timpson and Brian Redhead was first heard, the programme was about to enter its first golden era. Timpson is often referred to as avuncular, "genial, down-to-earth and very English", chortling at the amusing items that still peppered the programme and that he dubbed as a 'ho, ho'. Redhead, on the other hand, coming into the job straight from editing the Manchester Evening News, was seen as (according to a Sunday Times profile in 1987) "brash, cocky aggressively northern, good-natured, argumentative, talkative, honest, hard-working, bouncy, hugely enthusiastic and insatiably curious in how his friends, colleagues and critics see him." By the 1980s Today finally developed the hard-hitting reputation for which it is renowned. "If you want to drop a word in the ear of the nation", said Redhead, "then this is the programme to do it". Editor Julian Holland was keen to see the programme written about and noticed. His main aim was "to ensure a succession of serious and high-profile interviewees." Every set-piece interview was expected to create a 'news-line', i.e. "something that would be quoted in forthcoming news bulletins, or the Evening Standard, or the next day's papers". From the Radio Times 18 November 1978.
had decided to sail off to America later that year. Though staff announcer Joy Worth had presented the programme for four weeks back in 1959 it wasn't until 1978 that Today finally woke up to the fact that Women's Lib had actually happened and introduced the first regular female presenter, Libby Purves, who'd already been reporting and producing for the programme for a couple of years. Here is Libby and John Timpson in clips from Today dating from 1979 and 1980. There were some short-lived structural changes in the mid-70s. To provide a more balanced less London-centric programme the presenting was split between London and Manchester for a "new inter-city style of presentation". It was not particularly well-received but at least it gave Brian Redhead less of a commute from his home in Macclesfield. Not long after John Timpson made a temporary return to television so Nigel Rees anchored the London end with Michael Cooke (Look North and BBC Radio Sheffield) acting as Redhead's deputy in the north. Then there was the debacle of Up to the Hour in 1977. Network Controller Ian McIntryre (aka Mac the Knife) was keen to clip of the wings of news and current affairs in favour of more general programming. 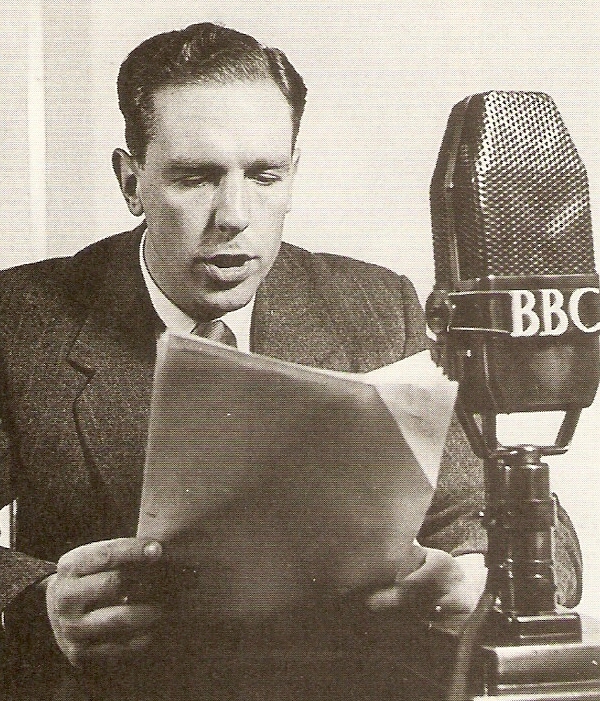 One of his decisions was the split the programme in two and fill the 25 minute gap up to the hour with a miscellany of news headlines, sport, weather, paper reviews and Thought for the Day mixed with programme previews plus bits of comedy and music all linked by a staff announcer. Libby Purves remembers how demoralising it was: "We had all this material coming out of our ears, the whole world to report on, stories to tell, and we hungered and thirsted for the Today programme to be a proper Today programme". Reacting to the carving up of Today listeners were not happy and expressed their indignation in letters to the Radio Times. "An untidy bundle of mediocrities" was one description of Up to the Hour. "A waste of valuable broadcasting time" wrote another. "Up to the Hour is the scrappiest and worst-conceived 'news' programme it has ever been my misfortune to hear. If I wanted to listen to music I would listen to Radio 2." There was some support to the changes with one listener appreciating the fact "that Brian Redhead and Nigel Rees no longer feel impelled to be facetious". "I so enjoy the new programme Up to the Hour, especially the few minutes of recorded comedy chat. The weather forecast, too, is improved. I'll also add that my husband is upset that you have replaced the pips with Big Ben." Libby Purves left Today in December 1981 and the role of third anchor was divvied out for a time between Wendy Jones, Hugh Sykes and Chris Lowe before Peter Hobday came over from Newnight in 1983, soon joined by a fourth presenter Sue MacGregor in 1984, initially splitting her time between Today and Woman's Hour. At this point in the history we should, I suppose, stop for Thought for the Day. This has been the one constant feature on Today since April 1970 (prior to that it was billed as Ten to Eight). Most of the staff "detest" the interruption for "reflections from a faith perspective on issues and people in the news" but it attracts "considerable affection" from listeners. One of the most popular contributors to the 'God slot' was the late Rabbi Lionel Blue. This is probably his final Thought for the Day from 20 June 2012. 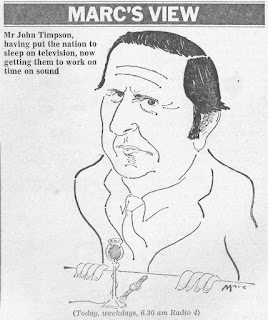 By 1986 John Timpson was beginning to feel unhappy with the dominance of political news, he was, apparently, more interested "in explaining facts than challenging opinions" so in December of that year he bowed out. 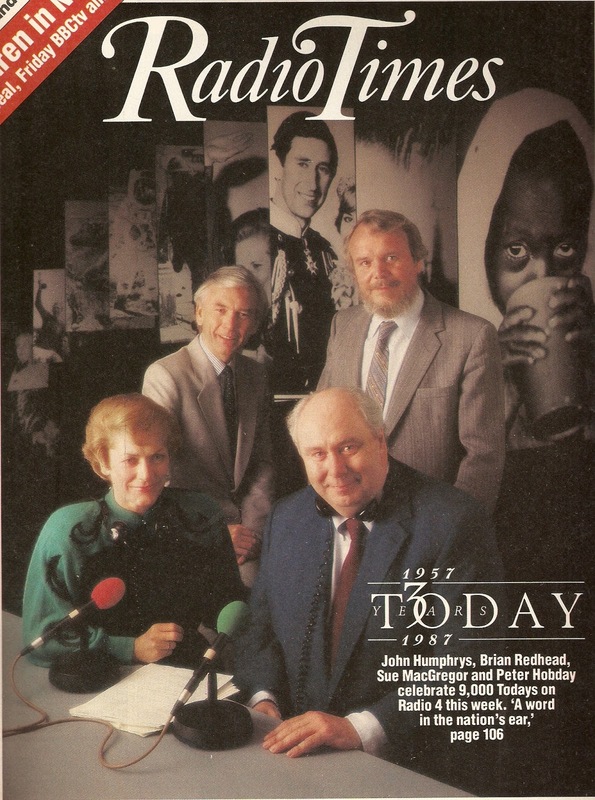 This is his final programme, co-presenting with Brian Redhead on 24 December 1986. Under Thatcher the political landscape of Britain had changed dramatically and Today had to change with it. Redhead "relished the opportunities all this provided for infuriating ministers and pricking their pomposity". But it was the decision of Jenny Abramksy in 1987 to bring in former foreign correspondent John Humphrys with his "detached cynicism towards politicians" that was a game changer. In January of this year John Humphrys reflected on the changing nature of political reporting and interviewing in the intervening 30 years. Jenni Murray was also presenting in 1986 and 1987 and, like Sue MacGregor, also on Woman's Hour before it was decided that Sue would stay with Today and Jenni would be the main presenter on Woman's Hour, where she remains to this day of course. Again looking to television rather than radio Anna Ford, at the time also reading the Six O'Clock News on BBC1, joined the team in 1993. But not that many months later the programme was thrown off kilter by the news of the death of Brian Redhead. His failing health meant that what was to be his final programme went out on 7 December 1993. The intention was that he'd be back on air after an operation but sadly following complications after surgery he died on 23 January 1994. The Today programme of 24 January 1994 was a rather subdued affair with news of Brain's death leading the news agenda. Presenting that morning was Peter Hobday and Sue MacGregor with tributes from John Humphries and Margaret Thatcher and heartfelt words from John Timpson. With the death of Brian Redhead it was John Humphrys who became the "voice of Today". By February 1994 editor Roger Mosey had drafted in, ahead of an already scheduled move, James Naughtie from The World at One to begin his 21 year tenure. 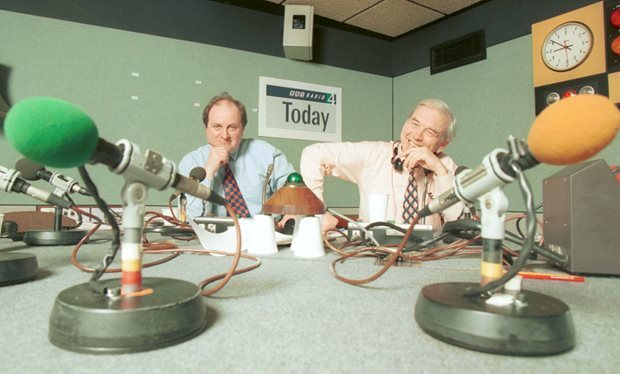 Later Humphrys would describe Naughtie as being "absolutely fascinated by the business of politics, by the House of Commons. For Jim, politics is almost a kind of art form and he appreciates it almost like an artist". 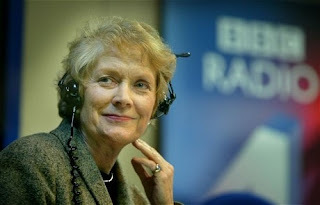 When Sue MacGregor finally left in 2002 journalist and occasional Today presenter Mark Coles wrote about her presenting style: "To many, Sue's style of interviewing is distinct from that of her fellow male presenters. She admits she often prefers the conversational to the cut and thrust of a full scale gladiatorial on air row. For former Labour leader Neil Kinnock it works. 'She's probably the most graceful of all broadcasters' he says 'very early in the morning to hear gracefulness coming out of the radio is a blessing....she's like a silken pin, sharp but decorous. She's not gentle, no-one should call Sue that. She can be very rough and very insistent - that's her duty, that's her job. But for those being interviewed even uncomfortably interviewed, the knowledge that someone has done their homework, the knowledge that they're not playing a game - not being adversarial just for the sake of it - is a source of comfort even when you walk out of the studio with wounds'". Here's the last nineteen minutes of Sue's final programme including the inevitable 'best bits'. Audio courtesy of Charlie Cooke. The programme itself occasionally hit the headlines, usually following some clash with a politician in the prime 8.10 am interview slot after the news. There were complaints of bias from Norman Tebbit, the infamous Nigel Lawson interview with Brian Redhead, Jonathan Aitken saying of Humphrys that he was "poisoning the well of democratic debate", accusations of 'smeary' questions from Brian Mawhinney, battles over who controlled the news agenda with New Labour's spin machine, the sexed-up WMD dossier reports of May 2003 and the uncomfortable interview, Humphrys again, of Director-General George Entwistle as part of the Savile fall-out in 2012. Some of these run-ins with politicians are covered in this 2007 BBC Four documentary Today: The Newspaper of the Airwaves. Narrated by Sheena McDonald it includes contributions from Mike Chaney, Reg Turnill (who appeared on the very first edition when he was one of the BBC's industrial correspondents), John Lloyd, Tony Benn, Sue MacGregor, Libby Purves, James Naughtie, John Humphrys, Rod Liddle, Jenny Abramsky, Norman Tebbit, Kenneth Clarke, Rev Richard Harries, Rabbi Lionel Blue, Anne Atkins, Neil Kinnock, Jonathan Aitken, Michael Heseltine, Lance Price, Andrew Gilligan, Kevin Marsh and Greg Dyke. The available pool of regular presenters has gradually increased to five with the last significant changes being the appointment of Mishal Husain in 2013 and Nick Robinson in 2015 and with James Naughtie stepping down in December 2015. This is the last hour of Jim's swansong, there's an interview with John Major with the inevitable loss of the line - the interview is picked up again later over the phone - and a tearful sign-off. In the last few months Today has again come under scrutiny with the gender pay gap between John Humphrys and his female co-presenters, and indeed between Justin Webb and Nick Robinson. More recently the incoming editor, Sarah Sands, formerly of the Evening Standard and with no broadcasting experience, was an appointment seen by many as tackling a programme that had become stale and complacent. However recent editions on London fashion week -leading to speculation that she had been instructed to give greater prominence to "girls stuff" - live reports by Nick Robinson from Silicon Valley and Puzzle for Today were seen as "lightweight" with one Labour MP accusing her of "destroying" the programme. Former editor Roger Mosey posed the question "whether a flagship like Today is the best place to experiment with magazine items, and particularly whether it’s right for these times". The political mire that is Brexit, a government with a wafer-thin majority, a Tweet-happy President and a crazed despot keen on blowing us all up means that the presenters of Today always have plenty of big political stories to chew over. But perhaps the biggest change on the horizon is nearer to home, the potential loss of programme lynchpin, John Humphrys. Rumours have been circulating that John might leave after clocking up 30 years of early rises but he's passed that milestone. Last year he said he wouldn't be there for the next general election, obviously not foreseeing unexpected snap elections. To conclude, in typical Today fashion, I should be racing headlong up to the 9 am time signal without crashing .... pip ... too late! This is a work in progress as quite frankly I ran out of time before publication. I've attempted to list all the presenters of Today, both regular and holiday cover. Until April 1959 the Radio Times didn't list the presenter. During the 1960s most of the cover presenters for Jack de Manio were staff announcers. The years refer to the dates they are listed as presenting even if this is for just a handful of editions. In some cases that person may have worked as a reporter on the programme during other years.